Click-On is an ontology editor developed as a tool for cooperative ontology design, involving ontology designers and domain experts, such as building engineers and energy consultants. It hides the complexity of coding ontologies in DL-LiteA formalism, facilitating the collaboration between ontology engineers and domain experts. This editor offers to the user two simultaneous views of an ontology: one for editing the taxonomy of concepts, and another one for editing the graph of non-subsumption relations. A user can generate new concepts by editing both views. The SEMANCO ontology editor, as most of currently available ontology editors, does not support free code editing in terms of XML code. The SEMANCO ontology editor addresses the following three requirements typical for the ontology design in the context of ontology based data integration. In the praxis a crucial task of ontology design projects is to assure correspondences between the formal assertions in the ontology code and the application domain knowledge that is usually expressed informally. Domain experts who are the carriers of this knowledge often lack the skills of formal knowledge representation, while ontology engineers lack the application domain knowledge. In this context the SEMANCO ontology editor on one hand restricts the number of design patterns used in an ontology and facilitates specification of these patterns in highly interactive manner. The domain expert are able to design complex ontologies simply by selecting options of the mouse context menu. On the other hand ontology design is partitioned in two sub-processes: specification of a taxonomy, i.e. a hierarchy of concepts subsuming each other (Figure, left side) and specification of non-subsumption relationships, i.e. concept properties (Figure right side). This design is basing on the assumption that specification of concept properties is more natural and simple process for domain experts. Following this assumption, declaration of a new concept is initiated by specification of its properties. In the second step such declaration is accomplished by defining the concepts location in the taxonomy. 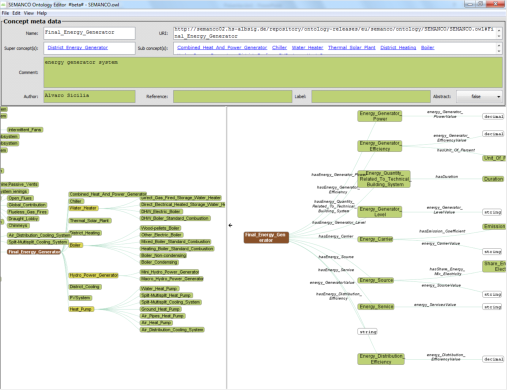 The SEMANCO ontology editor facilitates specification of ontologies using the DL-LiteA formalism, that especially addresses to the requirements of ontology based data integration. SEMANCO ontology editor limits generation of the OWL code to the elements available in DL-LiteA. Such limitation is achieved by providing to the user a finite set of GUI widgets, like context menu options. Each of these options generates, deletes or modifies an OWL code corresponding to a particular DL-LiteAelement. In order to involve domain experts into the process of ontology evaluation the SEMANCO ontology editor facilitates an ontology representation that reveals the implications which may not be obvious for domain experts faintly familiar with formal logics. To do so - instead of visualizing TBox assertions per se – the editor visualizes the result of a TBox interpretation including all borderline cases, like possible equivalence of concepts on the right- and left-hand in a subsumption axiom. To achieve high usability and optimized ontology authoring it is important that users are able to navigate through both inferred graphs (taxonomy and the properties graph) in a most natural and transparent way. In this context Click-On oﬀers the following settings that are shown on the control panel displayed in the middle of ﬁgure 3. IMPORTANT: Be sure you use the latest version of Java! The editor needs Java 7. The report is a description of two environments created in the project to support the ontology design and building, as follows. 1. An ontology editor, a tool to facilitate cooperative ontology design involving ontology designers and domain experts, such as building engineers and energy consultants. 2. A semantic data explorer to enable domain experts to explore the data exposed by the Semantic Energy Information Framework (SEIF). In recent years a lot of effort has been put into research dealing with accessing relational data with the help of ontologies. Solutions related to this issue focus on the Ontology-based Data Access architecture. Therefore the family of DL-Lite formalisms and in particular DL-LiteA has been developed to enable ontology design for efficient processing of conjunctive queries targeting a large amount of data stored in relational data bases. However, due to strong limitations and the comparatively high complexity of constructs comprised by DL-LiteA, it can be quite a challenging task to design ontologies which are based on this formalism. This paper presents an editor for DL-LiteA fulfilling ontology design. Thanks to its features, such as automated generation of axioms, on-the-fly inferring and graphical representation of relations between concepts, the editor simplifies the design process and improves the quality of the resulting ontologies significantly. The application and evaluation of the editor in two projects on data and knowledge integration for energy saving and urban planning confirmed these advantages.